Just had the chance to watch the play “Mentai Piriri” now playing at Hakata-Za! This hugely popular musical was aired as a TV drama back in 2013, receiving a massive acclaim from both audiences and critics alike, and in return it has been turned into a stage play in 2015, which has also garnered a huge success. 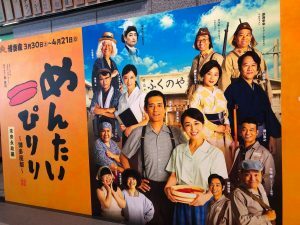 The story takes place in Hakata the early decades of the post-War period, and a movie version was also released on last year’s Fall. In “Mentai Piriri” all characters are really adorable, both in a comedic and in a tear-shedding way, to the point you too won’t be able to hold back your tears! It’s been less than three hours in a flash, and now I’m sure I really want to see the movie version, after watching this great play. 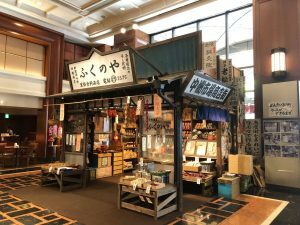 The stage set is also very elaborate, and it displays many of the old Hakata wards as they were back in the 1950s and 1960s, such as the area where WeBase Hakata is presently located, as well as Hakata Station as it was like back then, and even the quarters of Nakasu and Kushida Shrine are presented in magnificent detail as they used to be sixty years ago! 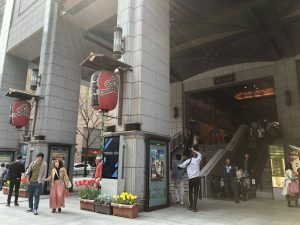 “Mentai Piriri” will be running on this season’s Hakata-Za program until April 21 (Sun). Come see this great play, don’t miss it!